Successfully Added Multi-Format Memory Card Reader (SD / MS / SIM / and More!) to your Shopping Cart. Multi-Format Memory Card Reader (SD / MS / SIM / and Many More). This multi-card reader for SD cards, memory sticks (MS), SIM cards (including 3G SIM cards), and other memory cards lets you access, copy, and backup a wide variety of memory cards. Looking for a simple way to transfer contact names and numbers from one mobile phone to another? Need to make a backup of your text messages? Want to access your memory cards without wasting time searching through dozens of different devices and wires? This one small gadget is all you need. 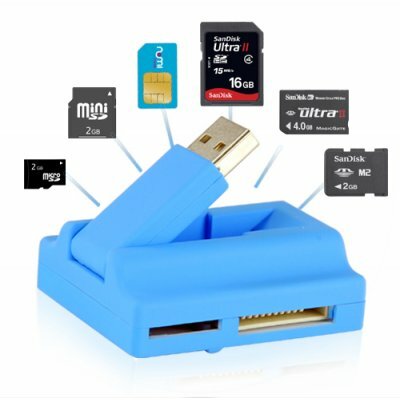 Just plug this multi-card reader into your computer and you can quickly and easily access a wide variety of SD cards, memory sticks (MS), SIM cards, and other memory cards. With a fashionable, ultra-lightweight design, you can take this multi-card reader anywhere you go for mobility and convenience. With this all-in-one multi-card reader, editing, saving, and copying contacts and text messages from your mobile phone is easy. Just pop in your regular SIM card or 3G SIM card and open up the included software. You can edit individual entries and even copy all your Phone Book and SMS data to your computer. Then paste your data onto another SIM card and you're ready to go! Anyone who needs to switch SIM cards, share contacts among friends, or make backups for peace of mind will appreciate this easy-to-use multi-card reader. Resellers, take advantage of this wholesale offer of ten multi-card readers at an unbeatable factory-direct price to stock up on this item for your store or online shop. With great functionality and ease of use, this item is sure to be a hot seller. Get yours today from the leader in high-tech, low-cost gadgets: Chinavasion! This device comes with the software required for reading and editing SIM cards. It does not require any software for reading other memory cards. Can I use this device with my SIM card? This card reader/editor works with GSM and CDMA SIM cards. It even supports 3G SIM cards. How exactly do I access my SIM card? Plug the SIM card into the card reader and plug the card reader into your computer. Install and open the included software. To access your Phone Book or SMS, you will need to first press the "Access Card" button (the first button in the bottom left, with an arrow pointing up). After you make changes to the Phone Book or SMS, make sure you press the "Save to Card" button (the second button in the bottom left, with an arrow pointing down). This Card Reader is a nice little thing without annoying cables. The installation of the readers SW went well, and the reader works like expected. I had problems with installing the SIM-Editor-Software. After several attempts I finally succeeded when making it Windows 95 compatible. Now I am able to edit my contacts in the Car-phone-SIM.